Counterrotation is mis-used quite a bit. 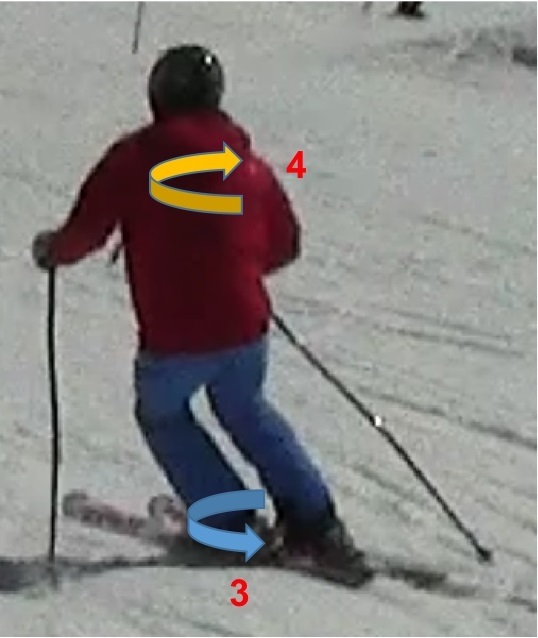 It really refers to making the skis turn one way by rotating the upper body the other way1, as a pivoting mechanism. In other words, to create an angular momentum of the upper body and then leverage this to rotate the lower body. It is generally an ineffective way to turn the skis, as it relies on gross upper body movements, but it is used generally in jumps and park skiing and other situations where the lack of contact ski-snow requires these types of movements. You can try this right now, by standing up in some slippery shoes or socks and just try to rotate your feet say to the right, quickly. If you pay attention to your body, to do that, you also counter-rotated the upper body to the left slightly and that's what allowed you to rotate the feet. Because the upper body is much heavier than the lower body, it doesn't have to turn as much to compensate for the momentum of the lower body (or to create it). In effective skiing, we ski from the skis up and we try to cause (3) as the result of the ski/snow interaction, while we do (4) to maintain balance and alignment (counteraction).